Today’s episode is a special live installment of Freakonomics Radio. You’ll hear about New York City’s subway system and the man who’s trying to fix it. You’ll hear about the relationship between Napoleon and music — and the relationship between politics and disgust, which is not as obvious as you might think. If you’d like to attend a future taping of Freakonomics Radio Live, we’d love to have you. We have upcoming shows in San Francisco on May 16th, Los Angeles on May 18, Philadelphia on June 6, London on September 6, and in Chicago on September 26th. For details, visit freakonomics.com/live. Stephen J. DUBNER: Good evening. 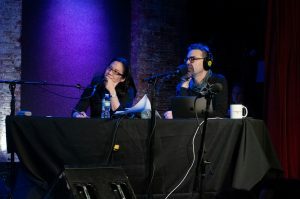 I’m Stephen Dubner and this is Freakonomics Radio Live, coming to you tonight from City Winery in New York City. As you know, Freakonomics Radio is typically a studio show based on lots of forethought and research and extensive interviews. In this live show, we throw all that out the window. No forethought whatsoever. Joining me tonight as co-host, would you please welcome the University of Pennsylvania psychology professor Angela Duckworth. Angela, if you don’t know, is the author of the longtime bestseller Grit: The Power of Passion and Perseverance. She’s also C.E.O. of Character Lab and one of the founders of Behavior Change For Good. Angela, what else are you up to? Angela DUCKWORTH: Through Character Lab, I’m hoping to quadruple the amount of behavioral science that’s done on kids and how they grow up to thrive. So we’ve been doing okay, but I think we should have more science so that we can have more to talk about on Freakonomics. DUBNER: Excellent. So as you know, we play here a game called “Tell Me Something I Don’t Know.” We bring guests onstage to tell us some interesting fact or idea or story. You and I will poke and prod them as much as we’d like. Then later on, our live audience will pick a winner. The criteria are very simple. No. 1, did they tell us something we truly did not know? No. 2, was it truly worth knowing? And No. 3, was it demonstrably true? Which is important. And to help with the demonstrably true part, would you please welcome our real-time fact checker. He’s the host and producer of ESPN’s 30 for 30 podcasts. Jody Avirgan. Hey, Jody. DUBNER: Something I learned about you very recently, Jody, is you have a young daughter who has become an Internet phenomenon. AVIRGAN: Well, she had a moment as an Internet phenomenon, actually, a photo I took of my daughter went viral. It was a photo we took of her after she’d eaten pizza for the first time. The audience is seeing it right now. She went to this sort of blissful state with pizza sauce all over her face. And I put it out into the world, and it went nuts. I checked this morning. Fifteen million people have seen this photo off of my Twitter account, and then it got ripped on to all of the meme accounts, and people were sending us examples of it being used in random Czechoslovakian advertisements. And the morning shows were asking us to come on. And we kind of just laid low. But yeah, it was kind of wild ride. DUBNER: All right, Jody, I’m glad to hear that your daughter is meme-worthy. I’m glad that you are here tonight to be our fact checker. Our first guest, would you please give a warm welcome. He is president of the New York City Transit Authority. Andy Byford. Andy, welcome to the show. Now, the audience — this puzzles me. DUBNER: Here’s what we know about you so far. You are president of the Transit Authority, which means that you essentially run the subways and buses. Correct? DUBNER: And most of these people, including myself — we ride your subways and buses. And yet, when you walked in, they applauded. Which to me, seems paradoxical. So by what magic has Andy Byford won over the transit riders of New York City? BYFORD: A British accent goes a long way. DUBNER: And I understand you come from a transit family. Correct? Third generation? BYFORD: I do. My granddad drove a bus through the Blitz, actually, through the Blitz. I ride the subway or the bus into work every day. I have never owned a car in my life. I probably never will. I rely on public transit and I believe in it. I’ve also failed my driving test twice. DUBNER: So, compared to the Blitz, and buildings being crumbled in the streets, I guess the New York City subways are easy. BYFORD: Oh, piece of cake. Absolutely, yeah. We have a long way to go. But it is improving. And what I wanted to do tonight is just talk about what we’re doing to make it better. DUBNER: Let’s start with a little history. Obviously, New York is one of the older subways — I guess London is the oldest in the world. BYFORD: London dates back to 1863, our subway is 1904. Coming here, the challenge is the same, but it is exponentially bigger. Interestingly, I’d say 15 to 20 years ago, the London Underground was in a similar state to that in which we find ourselves here in New York today. Stations looking a bit shoddy, unreliable signaling, tired vehicles, lack of funding. Sustained funding has transformed the Tube. That’s what we need here today. And a focus on basics. That’s what I want to talk about. DUBNER: I love that we’re getting applause for infrastructure funding. We’ve never had that before. So the New York City subway, as I understand it, has the worst on-time performance of any major transit system in the world. Is that accurate, first of all? DUBNER: Now, to be fair, New York’s subways generally get people where they’re going. They can be slow and crowded and unpleasant on occasion but they’re also transporting — how many million people a day? BYFORD: Well, for the whole of transit, it’s 8 million people. It’s made up of 5.7 million people on the subway, 2.3 million on the buses. And on a good day, going from the Bronx down to Manhattan, where I work, southern tip of Manhattan, that train hammered down the express line. You try doing that in a cab, and you try doing that for $2.75, you’re not going to do it. DUBNER: Right. When I think of New York, I think that one reason it was able to grow into the city it did was because it had subways early, and so it was able to move people around a lot, underground, without tying things up. The downside of that is it was an old system, and therefore I gather — like any old system — hard to retrofit, right? So can you just kind of set the scene for us, in terms of how good, I guess, the bones still are, and assuming they are good enough to upgrade as you’d like, what are the impediments to the higher speed, the fewer delays, etc.? BYFORD: So, I think it’s fundamentally, the system does have good bones. And let’s look at the positives. We do have express tracks. We do have a lot of stations. We have the most stations in the world. We have 472 stations. So, we’re starting from a good basis. But on a less-positive side, for various reasons, primarily lack of investment — crippling lack of investment — over the past few decades, the subway has been allowed to degrade, to the point that now we really struggle with on-time performance, because of lack of two things: one, lack of service reliability; and two, a crippling lack of capacity. DUBNER: Can you point some fingers, please? If your chief argument is that funding is necessary for maintenance of an expensive and complicated system — which seems obvious — where is it, has it been a lack of funding? Has it been poor spending? Is it the typical political hide-and-seek games, where the money is diverted? And I would like you to name some names, with email addresses, please. BYFORD: So, I think one of the lessons that constantly gets learned in transit is, you cannot stop investing in maintenance and what’s called state of good repair. People point to the subway system in Washington, D.C., WMATA. That was built in, I believe it was 1976. It’s really groovy, it’s a very sort of nice system. AVIRGAN: Usually on fire, though. BYFORD: Well, that’s the thing. People in D.C. — it stands for Washington Metropolitan Area Transit Authority — I’m told people say it stands for We Make A Town Afraid. That’s a bad place to be. Why? Because it was a new system, you can put it off. Politicians can put off the investment, because it works perfectly fine. So to your question, here, much the same. Politicians have lots of draws on their time. You’ve got to sort the roads out, you’ve got to sort out education, you’ve got to sort out hospitals. And for various reasons, this has snuck up on us. And you see this slow but incessant, relentless decline in terms of service reliability. The city’s population has grown. The infrastructure has got older, the pressure on it has got higher, the funding in real terms has dropped. And that’s why we’re in the state that we’re in. If what Byford is saying here about infrastructure and maintenance warms your heart, check out Freakonomics Radio episode no. 263. It’s called “In Praise of Maintenance.” Okay, back to Andy Byford. BYFORD: So, let me tell you what we’re doing about it. The city and the state have jointly funded what’s called the Subway Action Plan. So it’s installing what we call continuously welded rail — better rail that is less prone to rail defects. It’s about fixing leaks. It’s about renewing components. It’s about unblocking drains. So it’s really about fixing those elements that were allowed to degrade on the existing system. There were speed restrictions that were not necessary — speed restrictions went in initially, for a valid reason, that either the track had a defect years ago, or because we had trains that were made of wood years ago, or didn’t have such strong brakes. Those speed restrictions are no longer necessary. We had what are called signal-grade timers that were put in for a safety reason, but they’ve been allowed to fall out of calibration. BYFORD: It’s not properly calibrated. So that was my suspicion. Obviously, you listen to the customers, but you also look at data. What was it about 2012, suddenly the delays went exponentially up? That’s when we started putting in those signal-grade timers. They were wrongly calibrated. So we have set up a team called the SPEED Team. It stands for Subway Performance Evaluation and Education Development, because we love acronyms, right? We subscribe to the PUMA initiative at New York City Transit Authority. You know what PUMA stands for? BYFORD: Please Use More Acronyms. So we set this team up to cover, on a specialized train, every inch of New York City Transit’s 600 track miles. They drive at the signal at the speed that it should be set for. And if the train gets automatically stopped, then the signal is wrongly calibrated. So, so far, we have identified 320 such signals that are wrongly calibrated, and we’re working our way through correcting them. AVIRGAN: Can I just clarify one thing? You’re saying that the only way to test a signal is to take a train and drive it as fast as possible at the signal and see what happens? BYFORD: Well, just for the benefit of everyone listening on the radio — this fact checker is actually on his third bottle of beer. But just to clarify, to put everyone’s mind to rest — when I say drive the train at it, obviously it’s for the speed limit that should be, the signal should clear at that speed. AVIRGAN: But you need a full train to test that one signal? BYFORD: No, this is an empty train. This is an empty train. These are qualified people. DUBNER: I believe Jody’s question is, isn’t there software or something that does that? DUCKWORTH: Oh, you definitely want to test it with an actual train. BYFORD: —and if that signal, the signal plate, says that signal should clear at 15 miles per hour, but it’s actually what we call tripping the station, stopping it at a lesser speed, then it’s wrongly calibrated. DUBNER: Can I can I ask a funding question? So there is — as I understand it, a relatively new congestion surcharge on taxis and car services. And now, there is talk of another congestion fee for vehicles entering certain parts of Manhattan, which is what we more typically think of as a congestion fee. That money, we’re told, is directed to “the subways.” So: how much money will there be? Is it really coming to you? What is the money going toward? Etc. BYFORD: First of all, the for-hire vehicle surcharge, the one that you just described, and that will now start to see a flow of funding come towards — dedicated funding — coming towards transit, which I very much welcome, because the one thing, working in transit, that really cripples you, is stop-start funding. You can’t plan unless every year you’re thinking, well, what are we going to get this year? That’s no way to run a business. I need to be able to plan with certainty. The real game changer will be made major, sustainable, affordable, long-term sources of funding. And one of those suggested is a congestion charge. Because it does two things. One, it cuts congestion. And the other half of my focus is of course buses, which have the lowest speed of any North American bus system. Why? It’s nothing to do with my operators, the buses can’t levitate. They’re stuck in traffic. BYFORD: We’re working on that, by the way. But they’re hopelessly stuck in traffic. So what it gives you is, less traffic, but the traffic that does come in, pay a fee, and that fee must be lock-boxed, ring-fenced, cannot be siphoned off anywhere else, guaranteed go into funding. DUBNER: What’s your annual budget now, and what do you want, let’s say, two, five years from now? BYFORD: So, at the moment, the operating budget of New York City Transit is around $8 billion. So it’s a big chunk of cash, but bear in mind this is a huge system, in that we run thousands of services 24/7, which is another reason this is a tricky system to upgrade, because no one wants their lines shut down while we upgrade. DUBNER: It’s like the 24-hour diner, and you always wonder, when do they clean out the fryer? That’s what I wonder about you. BYFORD: I’ve often wondered that. That’s my next challenge. I’ve often wondered that. So, what we really need is to bite the bullet. And I’m saying, with the right funding, sustainable funding, we can turn this system around. No more tweaking. Let’s totally re-signal the network. Let’s make the system fully accessible. We can’t be proud of this system unless and until it is fully accessible to all New Yorkers. Let’s sort out the bus network. Let’s modernize the prevailing mindset, the bureaucracy of the transit network. So, some specifics: within the first five years, properly funded, we can re-signal five lines. In the next five years, for a total of 10, we can modernize 11 of the lines. In that 10 years, completely modernize 300 stations. We can make 180 stations accessible within that time frame. I’d need, we’ve calculated, $40 billion over those 10 years. Can we really not afford $4 billion a year, maybe two from the state, one from the city, $500 million from Washington, D.C., $500 million — maybe we could find it in Transit. We can move from state of emergency to state of the art within just 10 years. If we don’t do this plan, all that will happen is, the infrastructure will get even older, the population will grow even bigger, and the pressure on it will grow harder. But guess what? The price will go up. So now’s the time to bite the bullet. DUBNER: Jody Avirgan, we heard a lot of interesting ideas, some statistics, massive optimism, and, I would say, energy, which I admire. DUCKWORTH: Charm and charisma. And grit. DUBNER: A lot of grit. AVIRGAN: I want to talk specifically about one thing, which is, you said there is a lack of capacity. Are you running, at any given time, the maximum number of trains that could be on the system at that time? BYFORD: No, we’re not. No. And that is, again, something that we are in the process of addressing. A classic example of that would be the L line, because that line is one of the two that has communications-based train-control, modern signaling, that currently runs 20 trains per hour. After the upgrade, we’ll be able to run more trains because we’re providing more power. The signaling system can handle it. There’s not enough power. Which is ridiculous. So we’re addressing that. DUBNER: Andy Byford, thank you so much for coming on our show. Would you please welcome our next guest. She is an economic historian at N.Y.U. She studies creativity and innovation. Her name is Petra Moser. Petra. How are you? DUBNER: Good. You teach quite nearby at N.Y.U. How did you get here tonight? DUBNER: What do you have for us tonight, Petra? MOSER: So, I wanted to ask you whether you might know: how did Napoleon influence music? DUBNER: How did Napoleon influence music? Angie Duckworth, do you have any thoughts? DUCKWORTH: Did he commission a special piece for Josephine? MOSER: I don’t know that. DUCKWORTH: That’s not the answer then. MOSER: No, that’s not the answer. You got to be a little bit more creative. You got to think a little bit out of the box. DUBNER: Did it have to do with war-making? DUCKWORTH: I was so close. MOSER: It was good. If we put the two of you together, we’re actually getting somewhere. DUBNER: Since we’re not going to get there on our own, why don’t you tell us? MOSER: So, Napoleon started his Italian campaign at the end of the 18th century. And he won Lombardy and Venetia, which are two states in Italy. These states, by 1801 were under French control, and they got all the French laws, including copyright. But Italy did not have copyrights. So now in Italy, you have two sets of states. They have the same language, they have similar culture. They both get flooded with Napoleon, with the soldiers, with everything, with the gambling, all of that. But only two states have copyrights for the next 20 years. So now we can actually look what that does to music. Because now we have these two states where composers own what they produce, what they create, and what we wanted to see is whether, once you give an artist an intellectual property right, whether that actually makes them produce more and whether it makes them produce better stuff. DUBNER: What was your measure for quality? MOSER: Opera is really great. You can quantify both quantity and quality. So quantity is fairly easy. It’s really helpful that opera is a public art form. DUCKWORTH: You can count the number of operas. MOSER: Exactly. So, it’s public. So you can count it. But then, the other thing is that lots of people really love opera and they write everything about opera. So we have lots of people who just say, “Oh, this was a really notable performance, there are tons of people at this performance. People were streaming at the doors.” And there’s a record of that. So we know which were the hits. Then another measure of quality is whether we still play something today. So if something still plays at the Met today, or whether it’s still available on Amazon today, whether people want to buy it. DUBNER: But wouldn’t that be directly following on from whether they were popular or not, is that not the same thing? DUCKWORTH: How about how many stars it gets on Amazon? Is that part of the academic scholarship? MOSER: Not in this paper. DUBNER: So I’m not surprised that an economic historian would want to understand the innovation impact of copyright, because copyright and patent — we know there’s a lot of debate over how strong it needs to be to encourage the right amount of innovation, without overprotecting, etc. Did you go looking for opera first? Did you go looking for Napoleon? Did you go looking for old copyright law? MOSER: No. So, I’ve done a lot of work on patents. And when you do the same thing over and over and over again, you just get bored. And I sang a lot as a kid, and I was trying to sing opera in college, and then I took economics at the same time, and I liked that better. DUBNER: Do you have an example for us of an opera that was composed during that era, in one of those states — that you said — Lombardy and Venetia, you said? MOSER: Yeah, so we have a Rossini opera, L’Italiana in Algeri, which I think would be a nice one. DUBNER: Let’s hear some. Petra, you’re welcome to join in, if you’d like. MOSER: If you will, I will too. Let me break in here to say I chose not to sing that night, because I wasn’t warmed up. DUBNER: Okay, so tell us a bit about this Rossini piece, and how it’s an example of the phenomenon that you’ve measured. MOSER: Rossini was a very peculiar character, as many of these composers. He was also poor. And so he is a good example of the way in which copyright influences composers. So, he really responded to what people paid him. So, we have records of him saying to the theater managers, “Look, you are not paying me enough, so I’m just going to give you the same stuff over and over and over again. I just take this aria, and I’ve changed a little bit, and that’s it.” And that’s precisely what we think is not novelty — what we think is not creativity. But when he actually got enough money, then he would really make something that was better. DUCKWORTH: So what’s really interesting about that is that creativity, most people think of as being intrinsically rewarding, right? And in fact, people think that when you pay, you actually decrease the intrinsic amount of it. No? MOSER: This completely fits economics. He is poor. His mother and father were itinerant musicians. So he didn’t come in saying, “Oh, I’m just gonna do this for fun.” So he did it, in part, to make money. So, suppose, say, a composer today needs $2,000 to live. And say before copyright, you get like just $1,000 per opera. And now with copyright, because they have to pay you for repeat performances, you get $2,000. So now he only has to write one opera instead of two. That gives him the freedom to do precisely what he wants to do. So we actually see this in Rossini and other people, that they make things more complicated, they play around with things and he now has more time and he has more freedom. So it’s a wealth effect. DUBNER: I’m curious where you land on issues of copyright and patent ownership, in a world that’s obviously gotten a lot more complicated. And what your position is on the optimal copyright policy. MOSER: Having basic copyright protection is important for two reasons. The first one is that it gives people an incentive to produce better work, but then the other one is if you actually make art something that people can make money off, you also change the type of person who can become an artist. So we see this actually with 19th-century novelists. Before copyrights were really a thing, the only people who would write were people who, when we matched them with their parents’ wealth records, they were actually just wealthy — there’d be men and women, but they would both be wealthy. Once you have stronger copyrights in England, then, when you look again at the parents of the people who would become writers and become novelists, now all of a sudden we have people from humbler backgrounds. DUBNER: Petra, thank you so much for playing with us. Our next guest is a psychology professor at Cornell who studies how people make moral and ethical judgments. Would you please welcome David Pizarro. Hi David, what do you have for us tonight? DUBNER: Whatever comes next is not good. PIZARRO: And there’s just a mess, an un-flushed toilet. How disgusted would you be? Say, 10, really, really, really disgusted. Zero, wouldn’t bother you. DUBNER: This one goes to 11, I’m gonna say. DUCKWORTH: Depends on what’s in the toilet. As low as 5, as high as 10. AVIRGAN: I’d probably be in the 3 to 6 range. AVIRGAN: I’ve seen some stuff. PIZARRO: My follow-up is, what do you think this has to do with who you voted for in the last election, say the Presidential election? DUBNER: And do you study disgust? PIZARRO: I do study disgust. I’m really easily disgusted. So it’s a difficult thing to do, but that’s what grad students are for. DUBNER: All right. So the the example you’re using is an unflushed toilet. Could you use a different example? PIZARRO: One of my favorite examples, actually: how disgusted would you be if you took a sip of a soda can and realized it wasn’t yours? It was a stranger’s? DUCKWORTH: Yes, and I didn’t even know whose it was. DUBNER: I’m glad you brought that up, because I thought that was really strange. So you’re looking at how the emotion — is disgust an emotion, by the way? PIZARRO: Yeah, most people call it an emotion. I mean, there’s some debate, because it seems a little different from the other emotions, because it’s so reflexive. But I think most people who study disgust would call it an emotion. DUBNER: But what you’re getting at is, your research is about the relationship between disgust and political affiliation? PIZARRO: That’s right, political orientation. So, how conservative or liberal are you on the spectrum? And what we’ve found — the more disgusted you were, the more likely you were to say you were conservative. We’ve now looked at this across different countries, in different languages. We keep finding this relationship. The more easily disgusted people say they are, the more likely they are to be toward the right of the scale, less easily disgusted, toward the left. DUBNER: Let me ask you: so there’s a question we came across in a series we’ve been doing on creativity, and especially if you’re in the creative arts, the political orientation is way, way left. That led to conversations about, is there something about creativity in the arts that is correlated with liberalism? Because if you think of liberalism as essentially wanting to change the state of the thing, and conservatism as an attitude toward traditionalism, I’m curious whether you have anything to say about the mechanism by which that kind of relationship may exist. PIZARRO: Yeah, that’s been the most interesting question to us, because if you just demonstrate a relationship, that doesn’t get at the heart of the question. The question was what is the nature of this relationship? So one way to ask that is, what part of conservatism is really being captured by this? And so in looking at various measures, what we see is exactly what you said, Stephen. It’s the traditionalism aspect. Keeping things the way they are. So the old ways of doing things are good, don’t do the new things. DUCKWORTH: So is it true, then, that picky eaters and hypochondriacs are more likely to be politically conservative? PIZARRO: I don’t know the answer to picky eaters. That’s a very good question. DUCKWORTH: That would be your prediction maybe, right? PIZARRO: It would be the prediction. Although, whenever I talk about this stuff, I always want to point out that this isn’t — it’s not as if how grossed out you are is 100 percent predictive. About between 3 and 10 percent of why you might be liberal or conservative seems to be captured by disgust measures. DUBNER: Hey, something I’ve wondered about a long time is, the people who care for sick people, let’s say, I’m astonished that they’re able to do it so well and regularly, et cetera. And I often wonder, is that acclimation, or is it a trait? PIZARRO: That’s a really good question, And in fact, Angela’s colleague at Pennsylvania, Paul Rozin, one of the pioneers who studied this, did a study looking at first-year med students asking this question, trying to see, if you ask a bunch of questions like the ones I asked you, in general how easily disgusted are you in everyday life, and you get a score — so if we asked everybody here, there’d be a nice normal distribution. Some people are really easily, some people are not. He was asking those questions of incoming med students, and what he found was that most students were like the rest of the population coming in. After a year of medical school, when — as you might know, you have to poke into bodies, and you get used to bodily fluids and all that stuff — they were less disgusted when it came to that stuff. But not in general — they were still disgusted by all the other stuff, but they acclimated. So the answer to your question is, we’re really good at acclimating to specific things. Anybody who’s a parent knows you get used to certain things. DUBNER: Jody Avirgan, David Pizarro has been telling us about the politics of disgust, which are really interesting, and lead to a lot of interesting thoughts and questions. Anything factual we should know? AVIRGAN: This isn’t exactly a fact check. But I do want to go back to how you actually measure disgust. You ask people about hypothetical scenarios, and ask them to rate how disgusted they were. Do you trust that? AVIRGAN: Of actually disgusting people in real time — love it. PIZARRO: Of actually disgusting people. So they’ve brought people into the lab and they’ve asked them to do really gross but safe things. So, would you eat a piece of chocolate shaped like dog poop? DUBNER: I think Angela’s answer says less about her liberalism than about her chocolate attitude. PIZARRO: That may be right. And that’s why it’s a noisy measure. DUBNER: Exactly. David Pizarro, thank you so much. I really enjoyed having you here. DUBNER: Our next guest is the commissioner of the New York City Department of Transportation. Please welcome Polly Trottenberg. Polly, nice to have you here. Polly TROTTENBERG: Thanks for having me. DUBNER: First of all, tell us what the New York City Department of Transportation is and does, and how it differs from Andy Byford’s New York City Transit Authority please. TROTTENBERG: It’s a good question. Andy and I work together a lot, but New York City Department of Transportation, we’re responsible for roads, bridges, bike lanes, ferries, bike share, car share. DUBNER: Before we get into what you’re working on and what you’re going to tell us, Andy began by describing the general state of transit. What about your overall view — what are the big problems, and how many different dimensions do they exist on? TROTTENBERG: We actually have a different kind of challenge for a lot of my infrastructure, which is, it’s kind of a fun challenge. The city is growing in leaps and bounds. New York City now, population 8.6 million people, the highest it has been in the city’s history. Sixty-two million tourists last year. Incredible economic activity. Construction. And then of course, we have things like Uber and Lyft and Amazon, and Fresh Direct, which have just filled our streets, and made an incredible competition for space. Side note: Fresh Direct is an online grocery-delivery company in New York. They’re famous for having their trucks idle on the streets for hours. But one other thing they do is they rate their fruit on a five-star scale. So whatever fruit has five stars this week — maybe it’s pixie tangerines or red plumcots — you know it’ll be at peak flavor. It’s a smart system, and I wish this practice would spread; just thought you might like to know. TROTTENBERG: Meanwhile, a new generation that’s not so car-centric. They like transit, they want to ride bikes. They maybe want to ride scooters. There’s a big competition now, at least in my world, for street space. DUBNER: So, what do you have for us tonight specifically, then? TROTTENBERG: Well, when you build a bike lane on an avenue in New York City, what happens? DUBNER: You’re asking about safety? Are you asking about congestion? Are you asking about density, speed, or whatnot? TROTTENBERG: So, I mean all of the above. There’s a traditional view, when people who maybe aren’t cyclists think about bike lanes, they focus on the traffic elements of it. But there are actually a whole lot of other elements that come in when you put in a bike lane. DUBNER: So, I do know that when you add a lane to a highway, let’s say, it actually doesn’t ease congestion because it draws demand, right? TROTTENBERG: Induced demand is the phrase you’re looking for. DUBNER: Right. So is it the case that when you subtract a lane of car traffic and replace it with a bike lane, that actually it does not cause car congestion problems? TROTTENBERG: I’m happy to say, if you take out that lane but you redesign the street at the same time, you make the traffic move in a more orderly way, you put in turn lanes, and you change the signaling, you can keep the traffic speed some cases better, and a lot of cases sort of the same, while also adding in a safe space for cyclists. And just one of the statistics, where we put in bike lanes, we see huge safety improvements, not only for cyclists, who we consider a vulnerable population on the street, but for pedestrians and for motorists too, because it calms the traffic and it organizes it better. DUBNER: I love the way that you frame the problem, which is that there’s a competition for a resource, and the resource is space — street space, lane space, and so on. One thing that I’m curious on your position — in terms of congestion in New York City, I believe that 97 percent of New York street parking is free. Transportation scholars have found that an enormous amount of congestion in New York, and other places that offer free parking, is caused by cars cruising around looking for a parking spot. So economists think this is idiotic, that you’ve got something of value — this parking space — that you’re charging zero for, especially when it has so many negative externalities — causing congestion for everybody else, pollution, etc. So, have you thought about eliminating or severely limiting free street parking, as a means to address congestion generally in New York City? TROTTENBERG: Obviously from the economist’s point of view, it’s the same problem, both the parking and the road space, which is, it’s a scarce resource and demand greatly exceeds supply. We should price it. It’s a perfectly logical economic place to be. It is an impossible political place to be. DUCKWORTH: Nobody wants to give up their free parking. TROTTENBERG: The politics of parking has been, certainly for me, one of the most eye-opening parts of my job. It is something that is very intensely debated. We have, over the time that I’ve been in this job for five years, we have modestly raised parking rates. We have added in, in some places, bike share and car share, we’ve taken some of those spaces and repurposed them for uses that are more shared. But it’s certainly been a slow process. DUCKWORTH: Is that because of the endowment effect, that now that people already have their free parking. I mean, hard to get, but free parking. You just can’t take it away. TROTTENBERG: Yes. It’s not complicated. TROTTENBERG: And a lot of grit. DUCKWORTH: So could you just share a little bit of the story? How did you get into this calling? TROTTENBERG: I went to college here in New York, back in what we would say were the bad old days, when the city was experiencing a lot of difficulties, a lot of crime, a lot of disinvestment. And I just got very interested in urban policy and transportation policy. And one of the great success stories of New York — again, why my streets are so full, why Andy’s subways are so full — we took a city where there had been disinvestment, and we really turned it around. At one time, the Williamsburg Bridge was shut down because it was coming to pieces. Now we really invest in our bridges and our roads. So I think being part of that process — and now, today we have bikes and scooters, and Uber and Lyft, and all these other really exciting changes. DUCKWORTH: Does the bike lane innovation actually improve physical health? Because one of the other major trends over the last 50 years is that we just sit around all the time. TROTTENBERG: If you think about cycling as a mode, it is an inexpensive mode to own and operate. And for us to provide for. I mean, basically it’s paint. It emits no carbon, burns no fuel. It gets you moving, it’s physical exercise. It connects you to your city. Of course, it is terrific for general individual health, public health, and the health of the city. DUCKWORTH: Is there any evidence of that? I’m wondering whether when you put in a new bike lane, there is any measure that the physical health of, I don’t know, that community, that neighborhood has — that might be very difficult to quantify, but it would be very exciting if you could. TROTTENBERG: Well, we’re going to be looking at the long term health statistics. Anecdotally, we see evidence that it is getting people moving, particularly kids. But I don’t know, maybe Jody will dig up some some better numbers than I have. DUBNER: If you were able to start from scratch, would you have streets on a grid system? Because one thing that a grid does is it encourages speed, because it’s wide open, straight. TROTTENBERG: There’s a wonderful book written just recently about how the grid came about in New York City. And it was sort of a bunch of half-drunken foreign guys who threw it together a little haphazardly, when you read the book, it’s very surprising. When I’m in other cities where they have less of a grid — and for example, they have alleyways. I like to joke, I have alley envy. Because here in New York without those alleys, there are no places for the garbage trucks and the deliveries and the utility poles. Everything has to happen on those same streets where the cars are traveling, the buses are traveling, the bikes are traveling, and the pedestrians are traveling. So no, I think there are places where a grid is very efficient, but I would design it very differently. DUBNER: Jody Avirgan, Polly Trottenberg has been telling us about the roads primarily, and other things in her purview. Did you find anything that needs flagging? AVIRGAN: Angela, to your question about effects on public health, there was one study from the Mailman School here at Columbia University. It tries to measure the effect of a bike lane on an increase in the probability of riding a bike, and then quantify the effect on health, and reduced pollution, and then measures that against other public-health measures. And the conclusion is that investments in bike lanes are more cost-effective than the majority of preventative approaches used today, so we’ll see. That’s one study. DUBNER: Polly Trottenberg, thank you so much for joining us tonight. It is time — I’m so sad to say — for tonight’s final guest. She is a professor of mechanical engineering at the University of Pittsburgh. Would you please welcome Katherine Hornbostel. Katherine, it is nice to have you. You are our last guest tonight, so make it good. What do you have for us? Katherine HORNBOSTEL: All right. No pressure. So, if I handed you a bucket filled with water and laundry detergent, and asked you to tackle global warming, what would you do? DUBNER: Oh, that’s so easy. DUCKWORTH: You would wash something. DUBNER: Hey, don’t yuck my yum. I would make a giant bubble bath, and I would invite the climate lions and the climate lambs to lie down together in the bubble bath and relax, and proceed to have an empirical, sane conversation about the best ways to address climate change. That’s what I would do with a big bucket of soapy water. HORNBOSTEL: I really like that approach. DUBNER: Are we done here? Is that the answer? DUCKWORTH: That’s exactly what she was gonna recommend. HORNBOSTEL: I can’t say I wrote about that approach in my paper. Do you have any other suggestions? DUCKWORTH: I don’t really know what’s in laundry detergent — can you give me a hint? HORNBOSTEL: Yes, so I’m actually talking about the active ingredient sodium carbonate. I don’t know if that helps. DUCKWORTH: Sodium carbonate. Is that baking soda? DUBNER: Would you wash the sky? HORNBOSTEL: Not quite — what would I be wash— are you saying, like, throw a bubble bath in the air? DUBNER: Like one of those geo-engineering schemes that run a giant hose into the stratosphere and spray out some benign material that refracts sunlight, that kind of thing? HORNBOSTEL: Not quite. That is a very creative approach. So, I’ll give you guys a little bit of a hint: I’m going to send you to a coal power plant with this bucket of water and detergent. DUCKWORTH: So, what is the specific, I guess, byproduct or whatever, of coal burning, that’s bad — and then maybe we’ll be a little closer. HORNBOSTEL: There are a lot of things that come off of coal that are bad. Some of them, thankfully, we already have regulations against — things like SOx and NOx. They already scrub a lot of the crap that comes off of coal plants. DUBNER: Can you give the full name of SOx and NOx, please? HORNBOSTEL: So, sulfur oxides and nitrous oxides. Gaseous compounds that are bad for the environment. DUBNER: Because we all thought it was a Dr. Seuss story. HORNBOSTEL: So, carbon dioxide is the other obvious one, that there are no regulations for, currently, for coal plants. DUBNER: Are some of the emissions in a coal plant, do they react in some way, negatively, I guess, with sodium carbonate? Is that the idea? HORNBOSTEL: You’re on the right track, you’re getting very close. DUBNER: So I don’t think we’re going to get closer without a mechanical engineering degree, which you do have. HORNBOSTEL: So, this particular combination — water and sodium carbonate — if you dissolve it in water, can react with carbon dioxide and extract it from a gas stream coming off a coal plant. And the really interesting thing that I’ve studied is that if you put these chemicals into little capsules that look like caviar, you can actually pack them into a reactor, attach it to a power plant, and selectively take out the carbon dioxide that’s being released from the exhaust. DUBNER: So you’re describing a form of carbon capture, correct? HORNBOSTEL: Yes. It is a carbon-capture technology. DUBNER: What stage is it in? Are you one of the inventors of said technology? HORNBOSTEL: Yes, I was on a team at a national lab from the D.O.E. that invented and studied this technology. It’s been demonstrated at a lab scale. Currently we’re looking for partners to adopt it. Not at a power-plant scale yet, but at smaller scales to test out and figure out the kinks and try to scale it up. DUBNER: And what you’re describing, there is obviously chemical reactions here. But is it essentially a filter? HORNBOSTEL: It’s a good question. It’s not exactly a filter — I guess you could think of it from a big picture standpoint as a filter, though. So you’re sending the nasty gas from a power plant through it, it selectively takes out carbon dioxide. At some point it reaches capacity. And then you have to de-sorb or remove the CO2 from the full solution. DUBNER: And how do you do that? HORNBOSTEL: So, usually you have to heat up steam and send it through these capsules, and it’ll take the carbon dioxide back out. And then you pressurize it and put it underground. DUBNER: Okay. So, it’s carbon capture, you bury the carbon underground, which some people have big concerns about there. What’s your level of concern on that? DUCKWORTH: Does it just stay there forever? HORNBOSTEL: Really, if you find the right formations — that’s kind of beyond my research area, but the scientists on that side are pretty confident you can store a lot of carbon dioxide underground. Just the sheer magnitude of carbon dioxide emissions requires that we put it underground at this point. DUBNER: So the unit or machine that you’re talking about, what do you call it? HORNBOSTEL: So I guess I would call it a reactor. So, it’s basically a giant vat filled with this solution that will react with carbon dioxide to hold it, until you need to release it and store it. DUBNER: So, I can’t tell whether it’s because you cleverly began the conversation by talking about laundry detergent. Was it as simple, really, as just getting something kind of like laundry detergent and figuring out how that responded to these carbon emissions? HORNBOSTEL: Yeah I mean, so it is simple compared to other technologies for carbon capture. By putting them in small capsules, what you’re essentially doing is raising the surface area. So imagine a big vat filled with caviar. You have a very large surface area of contact between the liquid in those capsules and then the gas flowing through, which really allows you to use these very simple ingredients, instead of a very tricky or corrosive solvent instead. DUCKWORTH: So you said laundry detergent is a lot like baking soda. Now, this might be a digression, Stephen, but since I have a mechanical engineering professor — is that little box of baking soda that I have in my refrigerator, is it really absorbing the odors? DUBNER: I love how she can tell us about carbon capture, and this is the tough question for her. DUCKWORTH: This is the most important question of the evening. HORNBOSTEL: The more degrees you get, the farther removed you are from practical solutions to things like that. So, sodium carbonate reacts with carbon dioxide. It actually forms baking soda. So that is the reaction — that is the product of this reaction. I guess to emphasize here is that both the initial chemical and the final product are both very safe, very cheap, very abundant. DUCKWORTH: I have to ask this question: this is such a simple, elegant, commonsense, straightforward, hiding-in-plain sight — was your team composed mostly of women? HORNBOSTEL: We had a very good proportion of women on my team. DUBNER: So, when I hear the words “safe, cheap, and abundant,” it does sound literally too good to be true. So let’s pretend that you were not involved with this project at all. But you knew about it, and you knew all the other competing carbon-capture systems that are being developed and funded and so on. What would you put the odds of this project succeeding — I’m not saying as the only carbon capture solution, but as a significant one? HORNBOSTEL: So, I’m very confident that it could work if we invested and did it. Confidence in terms of whether or not this will be the winning technology — lower, much lower, just because there are a lot of technologies out there for carbon capture, there’s a lot of competition, there are some others that are much more mature than ours. DUBNER: Does it have a name? HORNBOSTEL: We call it M.E.C.S. It’s an acronym — so, Micro-Encapsulated Carbonate Solution. HORNBOSTEL: I just call them capsules, but I’m open to suggestions. DUBNER: I like the caviar idea. DUCKWORTH: Oh, I like that. DUBNER: It says here you invented something else a few years back called the Pump2Baby Bottle. HORNBOSTEL: I didn’t expect you to bring that little curveball up. Yes. So I had twins when I was in grad school. I was pumping for them. And they did not nurse well, and so I invented this little hack where you can actually feed your babies breast milk as you’re pumping it. So you attach it to any breast pump, as you’re pumping the milk, the baby starts drinking it. DUCKWORTH: That is genius. Did you patent it? Did you make a lot of money? HORNBOSTEL: In the process of patent prosecution right now. Filed for patent, working on it. DUCKWORTH: If you are not jumping up and down with excitement about it, then you have not nursed a child or pumped. DUBNER: Yes, I haven’t. I’m gonna confess right now. Hey, Katherine Hornbostel, thank you so much for telling us something we didn’t know. And can we get one more hand here for all our guests please. It is time now for our live audience to pick a winner. Obviously, all our guests have come here in the spirit of inquiry and information-sharing so we shouldn’t reduce this thing to a horse race but — well, this is America, and we really like to know who wins. Who’s it going to be? Freakonomics Radio is produced by Stitcher and Dubner Productions. Our staff includes Alison Craiglow, Greg Rippin, Harry Huggins, Zack Lapinski, and Corinne Wallace; we had help this week from Morgan Levey, David Herman, and Dan Dzula. Our theme song is “Mr. Fortune,” by the Hitchhikers; all the other music was composed by Luis Guerra. You can subscribe to Freakonomics Radio on Apple Podcasts, Stitcher, or wherever you get your podcasts. Angela Duckworth, University of Pennsylvania psychologist and author of Grit. Jody Avirgan, host of ESPN’s 30 for 30 podcasts. Andy Byford, president of the New York City Transit Authority. Petra Moser, economic historian at New York University. David Pizarro, psychologist at Cornell University. Polly Trottenberg, commissioner of the New York City Department of Transportation. Katherine Hornbostel, mechanical engineering professor at the University of Pittsburgh. “Copyrights and Creativity: Evidence from Italian Operas,” by Michela Giorcelli and Petra Moser (Journal of Political Economy, 2016). “Disgust Sensitivity, Political Conservatism, and Voting,” by Yoel Inbar, David Pizarro, Ravi Iyer, and Jonathan Haidt (Social Psychological and Personality Science, 2011). “The cost-effectiveness of bike lanes in New York City,” by Jing Gu, Babak Mohit, Peter Alexander Muennig (Injury Prevention, 2017). “Packed and fluidized bed absorber modeling for carbon capture with micro-encapsulated sodium carbonate solution,” by Katherine Hornbostel, et. al. (Applied Energy, 2019). “In Praise of Maintenance,” Freakonomics Radio Ep. 263 (2016).